The Oscar Night of Aviation. This year's the 45th Annual Enshrinement Ceremony, the Oscar Night of Aviation, was held in Dayton, Ohio, home of aviation pioneers Orville and Wilber WrightEvery year since its founding in 1962, the National Aviation Hall of Fame pays special tribute to aviation and aerospace pioneers with an enshrinement ceremony to honor individual accomplishments. What started more than four decades ago as an informal gathering of test pilots, aircraft engineers and enthusiasts has grown into a spectacular black-tie awards program aptly described as The Oscar Night of Aviation. This year the 45th Annual Enshrinement Ceremony was held on Saturday, July 15th in Dayton, Ohio, home of aviation pioneers Orville and Wilber Wright the organizations original inductees. Others inducted since then have included aviation legends like Neil Armstrong, John Glenn, Charles Lindbergh and Chuck Yeager. This years ceremony was special for several reasons. Tony Bill, Academy Award winning actor, producer and director was master of ceremonies, chosen not only for his on-stage presentation talents but for his love of aviation as well. His latest film, Flyboys, is about the birth of aerial combat in World War I and Aviation Hall of Fames former inductees inspired two of the films characters. He introduced four new inductees during the ceremony: Cliff Robertson, actor and aviation enthusiast; Bessie Coleman, first licensed African-American female pilot; David Lee Tex Hill, World War II fighter ace; and Robert White, the Air Forces record-setting X-15 pilot. 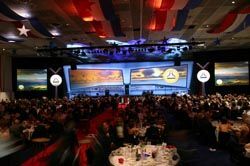 Beyond the need to showcase these award recipients, the National Aviation Hall of Fame was faced with a special challenge: How to keep attendance and enthusiasm growing in the wake of its historical 2003 ceremony which celebrated the 100th Anniversary of powered flight? Attendance for that event surpassed 2,300 yet the audio visual staging had remained virtually unchanged since then. The answer? Put the audience in the cockpit. Since most attendees tend to be pilots, astronauts, engineers and aviation enthusiasts, why not design and build a stage to make them feel right at home? The team of Markeys Rental & Staging led by producer/director John Griffith conceived a 3-dimensional scenery set in the form of an aircraft cockpit, complimenting the look with wide screen video and audio effects to simulate takeoff, in-flight maneuvers and landing. To accomplish this, Markeys designed a 92 wide stage using two extra wide 17.5 x 40 rear screens for the cockpit windows. Special screen surrounds were fabricated to provide greater realism. Behind the screens were four Christie DS+8K projectors and a Barco/Folsom Encore system to allow for edge blending, picture in picture, text animation and other special effects shown in 2560 x 1024 resolution output per screen. Key to the creative execution was the use of Microsoft Flight Simulator TM software to provide realistic in-flight effects including airport runways, clouds, terrain, and weather patterns. Using a flight simulator as a primary video/graphics source, in front of a thousand people who know a shaky take off when they see one, provided lots of fun and some interesting challenges. "I can take off and do in-flight maneuvers with no problembut landing safely is not quite as easy, said Griffith, who directed the show from FOH while controlling the actual joystick. Moreover, the flight simulator works in real-time, so taking off in Dayton with a landing in L.A., for example, would take about 4 hours assuming non-stop. That becomes a problem when the show is only 3 hours. To circumnavigate those obstacles, Griff had to use the simulators jump back feature to re-set the scene during video rolls and dinner break. Markey's designed a 92' wide stage using two extra wide 17.5' x 40' rear screens for the "cockpit" windows. To complete the effect, Markeys used audio effects including cockpit-traffic control tower chatter during takeoff and the whir of fanjet engines in-flight. Audio pre-sets were accomplished through the Instant Replay 360 system. An off-stage announcer cued the audience to take their seats and fasten your seatbelts in preparation for the ceremonial flight. Ironically, the dinner portion of the event needed no sound effects at all, but the clinking and clanging of dishes and silverware provided a symbolic reminder of aviations heyday when passengers enjoyed full course meals on board. Hall of Fame monogrammed airsickness bags were placed on all banquet tablesjust in case. Beyond the special effects and dcor, the show featured traditional video rolls, title graphics and sponsor logo scrolls along with image magnification throughout the evening on two outboard 15x 20 screens featuring Christie Roadster 16K projectors and a (4) Sony SDI - triax studio camera switch rig. Markeys also shot the enshrinement Vignettes and produced several hundred still and motion graphics on site. Camera system included an E-Studio Live 5500 switcher from Echolab with composite, component and SDI input/output cards. The fully switched program was recorded onto Sony Beta SP 2800 record decks, Sony DSR 1500-A DVCam, Pioneer PRV-LX1 DVD recorders and Panasonic DS-555 VHS decks. The team of Markey's Rental & Staging led by producer/director John Griffith conceived a 3-dimensional scenery set in the form of an aircraft cockpit, complimenting the look with wide screen video and audio effects to simulate takeoff, in-flight maneuvers and landing. Having all the equipment in place, we needed a set design that would sell the idea of a flight simulator. The Impact Group out of Indianapolis worked with Griffith to bring to life the simulator look. Sean Johnson helped with the overall design and graphics. Created using set flats and vinyl graphics, we accomplished the faux image of being inside an aircraft from any vantage point in the room.